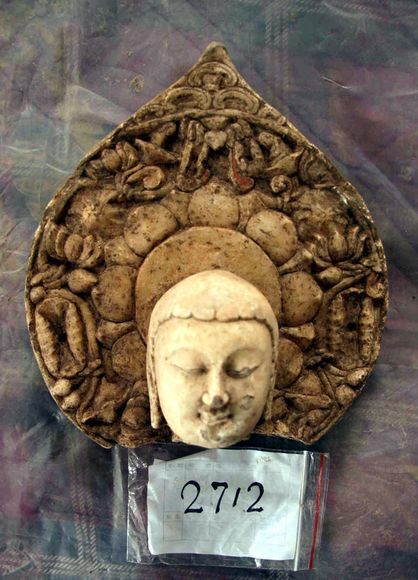 A stone Buddha missing its body is one of nearly 3,000 ancient statues depicting the enlightened prince that were unearthed in northern China earlier this year. The Buddha's head is surrounded by a halo with a large central lotus-leaf blossom—an important symbol in Buddhism of purity and rebirth. "The Buddha had a bump on top of his head that represents his extra wisdom," Tsiang said. "In this case that extra protuberance is not very high. It's just shown as a slightly raised part of the skull." In fifth-century China, Buddhists would often pay to have craftsmen carve a statue of the Buddha, which they would then donate to temples. "It was a way of doing good deeds, generating merit," Tsiang said. "People who gave gifts to temples were considered deeply deserving of rewards, which could include good health or protection by the Buddha." Often the statues would include inscriptions wishing a deceased loved one a good rebirth or the attainment of enlightenment. 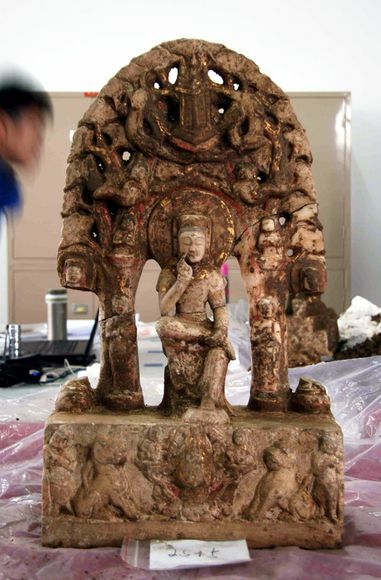 Some of the statues gifted to Buddhist temples by ancient Chinese donors—such as this newfound sculpture of a bodhisattva, or enlightened Buddhist being—were elaborately decorated at great expense. "People wanted to show their generosity with the use of expensive materials like marble and bronze and expensive pigments and gold," Tsiang said. Statues like this one—of young figure in a cross-legged pose common in Buddhist art—were common in fifth-century China. Such sculptures refer to a formative period in the Buddha's youth, when he had first contemplated the suffering of life and resolved to detach himself from this world while seated in the shade of a bodhi tree. 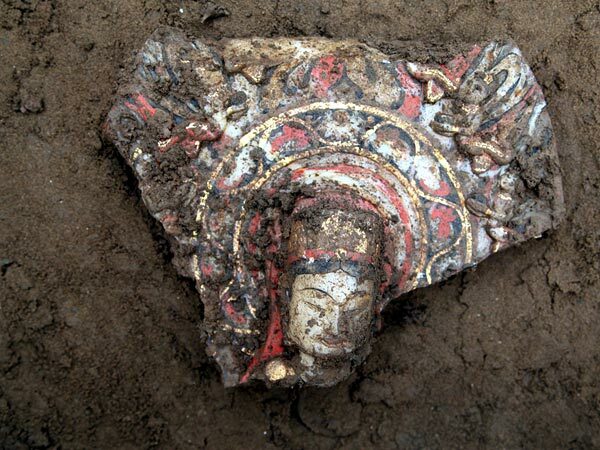 "This is an image derived from India that appeared in scenes of the life of the Buddha, and it shows the Buddha as a prince before he went in search of enlightenment," Tsiang explained. The popularity of this "contemplative" pose amongst Buddha statues in fifth-century China may be related to the growing belief at the time that living Buddhist practitioners could also achieve enlightenment, Tsiang said. "People learned that Buddha himself was a human," she added, "and that it was possible for them to become enlightened through study, cultivation of spirit, and meditation."